Huntkey reveals the X-MAN 90W, a universal notebook power adapter with a 5V (2A) USB charger for smartphones and tablets. Huntkey Enterprise Group, a global professional power supply provider, is introducing their latest ultra-slim (1.7 cm), super-light (267.8 g) universal notebook adapter, the Huntkey X-MAN 90W. With 10 exchangeable power-tips this notebook adapter is supporting all major notebooks with 18V~20V input voltage available on the market today. 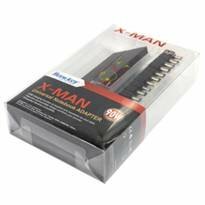 Furthermore, Huntkey’s X-MAN is equipped with a 5V USB power port to charge mobile phones, multimedia players and digital cameras. What sets the Huntkey X-MAN 90W power adapter most prominently apart from the crowd is the support for charging with 2A (2 Ampere), where most others only provide 1A. This in turn provides compatibility with a wide range of tablet PCs as well. By applying Huntkey’s own production process overall power density has been increased by almost 25%, while maintaining very low temperatures, resulting in ultra slim dimensions of 117.3(L)*68.5(W)*17(H) mm. At the same time power efficiency has been improved by another 2.3% now reaching 89%. All of this in combination with a handy carrying bag make the Huntkey X-MAN power adapter a convenient travel companion. To stay on the safe side even in regions where power fluctuation is common-place, special protection precautions have been implemented such as Over-Voltage Protection (OVP), Over-Current Protection (OCP), Over-Temperature Protection (OTP) and Short-Circuit Protection (SCP). By virtue of its compact size, elegant black design, broad compatibility and usage versatility the Huntkey X-MAN universal notebook adapter is not just ideal for traveling but also as a spare adapter that you can place at, for example, at your work place so you don’t need to carry additional weight back and forth.